It may not be the centre of the world or indeed the centre of the UK but Hammersmith is quite an important and historic part of the capital. Birthplace to many famous people, home to a large number of large companies and even home to the pub with the (allegedly) smallest bar in the world. 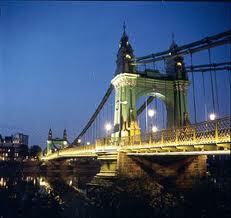 Hammersmith is one of the busiest and most pivotal areas of the capital. And then there’s entertainment. Hammersmith Apollo has seen more or less every major music act appear on its stage its stage in its eighty year history. Hammersmith really is the centre of attention. So why not make it hog roast Hammersmith, too? We recently catered in Wormwood Scrubs Park in Hammersmith where we were required to roast a whole hog on our machine and serve 450 guests with succulent hog roast sandwiches with all the perfect trimmings. We also grilled 100% beef burgers and chefs own gourmet sausages and served them with fresh bread rolls and a selection of sauces for 300 guests. 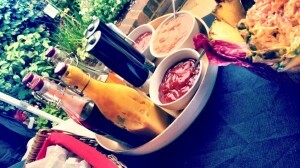 All the food was very well received and drew many compliments from the guests. That’s what we like to here! Hog roast Hammersmith may sound unusual but it quite rightly acknowledges the fact that hog roast is back in business. Hog roast is fast becoming one of the catering foods of choice both in this part of the capital and across the UK as a whole. For anyone planning a major event or special function then hog roast really should be at the top of your list when it comes to the catering. 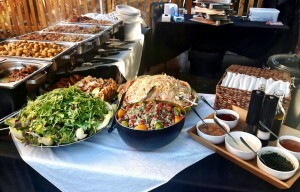 Making your event a hog roast Hammersmith event will really add something special to the occasion. There’s nothing like adding a bit of culinary magic to a ‘do’ and hog roast will allow you to do precisely that. Hog roast is the medieval glamour feast that your twenty first century party goers will love just as much. Whether your event is an informal garden party for friends and relatives, a posh wedding reception or a key corporate event where you have associates to impress, hog roast can be the perfect solution. The hog roast chef is an expert at helping these events go like clockwork. The hog roast chef is there to take the pressure off you and ensure that you have a fantastic time without you having to worry about the food one bit. The hog roast chef’s job is of course a very important one. Did you know that the average hog roast takes around six hours to cook? Six hours may seem like a long time but we are talking about a whole pig here, and if you want to get the very best flavours from any joint of meat, let alone a whole pig, then slow roasting is the name of the game. One of other factor that contributes to the great taste is the quality of the meat. Your Hammersmith hog roast chef takes great care to cook only top quality pigs from a reputable source, ensuring the taste is top notch. Everybody loves to watch the hog roast chef in action. Carefully tending the whole pig on the impressive looking hog roast machine is a sight in itself. And this process only helps to waft around the incredible aromas around your venue even more. Don’t settle for anything less than the very best for your event. Contact your local Hammersmith hog roast chef and let your guests enjoy the incredible flavours of a freshly cooked hog roast.